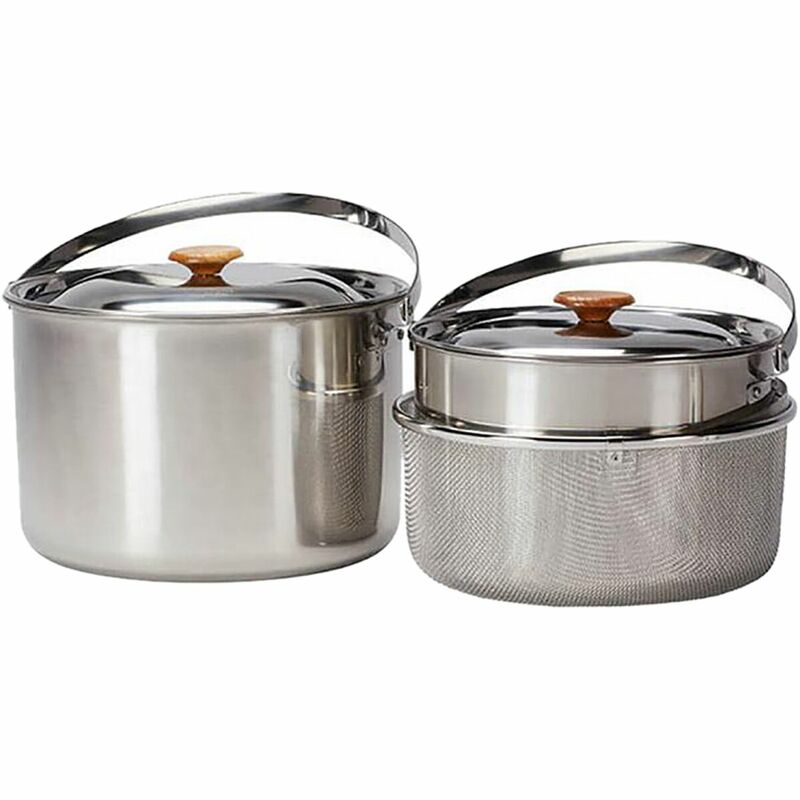 The Snow Peak Titanium Cookware 3-piece set is the minimalist's cookset. Ultra light is the name of the game with this 3-piece modular set. 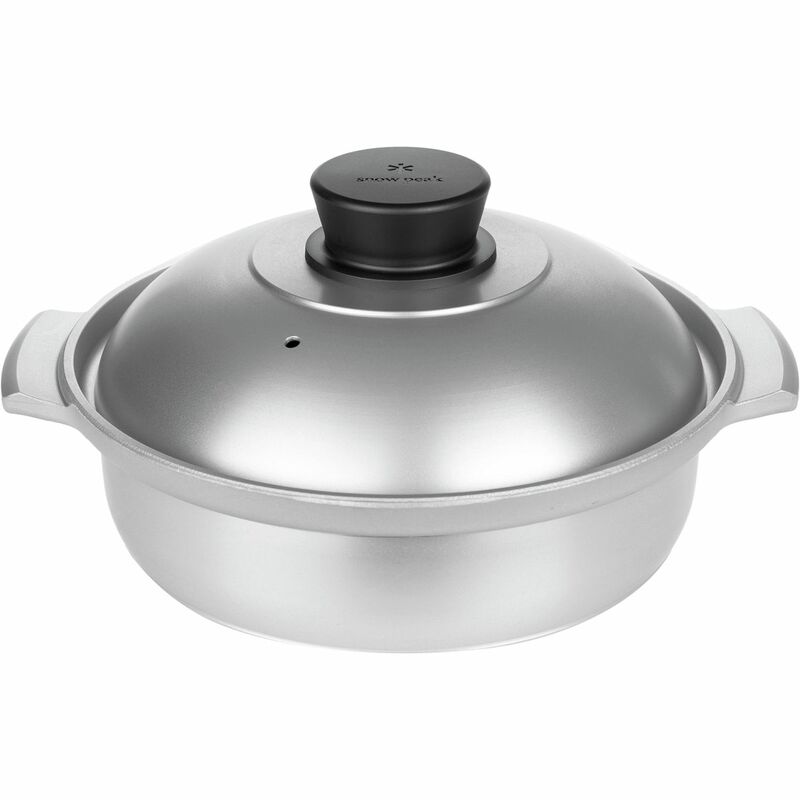 The Snow Peak Titanium Cookware nests neatly with other Snow Peak products for convenient storage and packing. It includes a large pot, small pot, and a frying pan. Total stowed dimensions are 5. 5" x 2. 25", and it weighs 7. 1oz, making it perfect for fast 'n' light minimalists. A Snow Peak GigaPower stove fuel canister can be neatly stowed inside the smaller pot. Rounded edges actually make cleaning up a lot easier, as well. 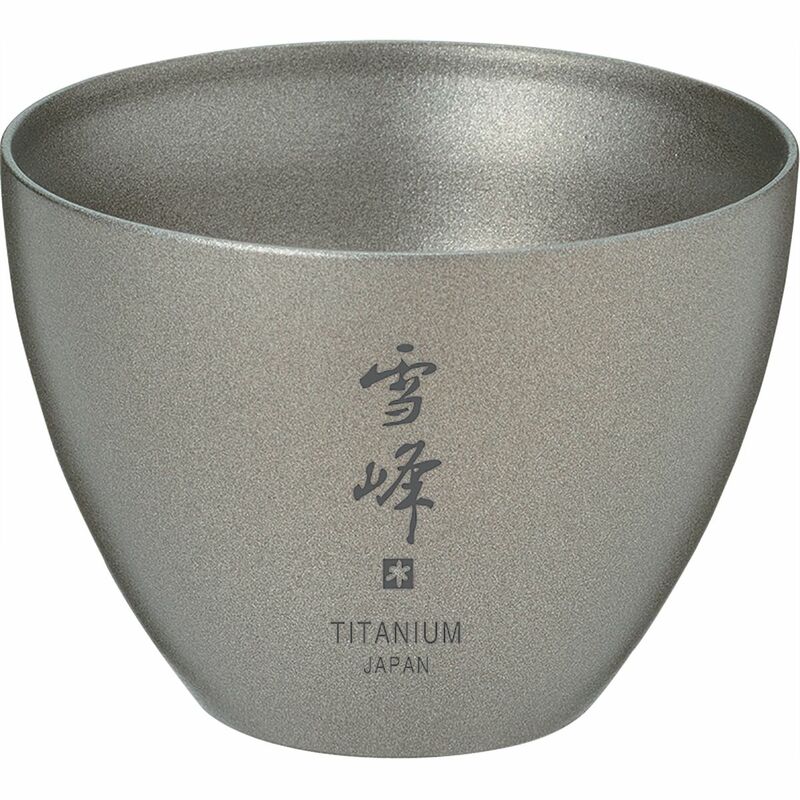 Your camp mates can swill their boxed wine and burnt campfire coffee, but you have your Snow Peak Titanium Sake Cup filled to the brim, so you can enjoy refreshments of a higher class. 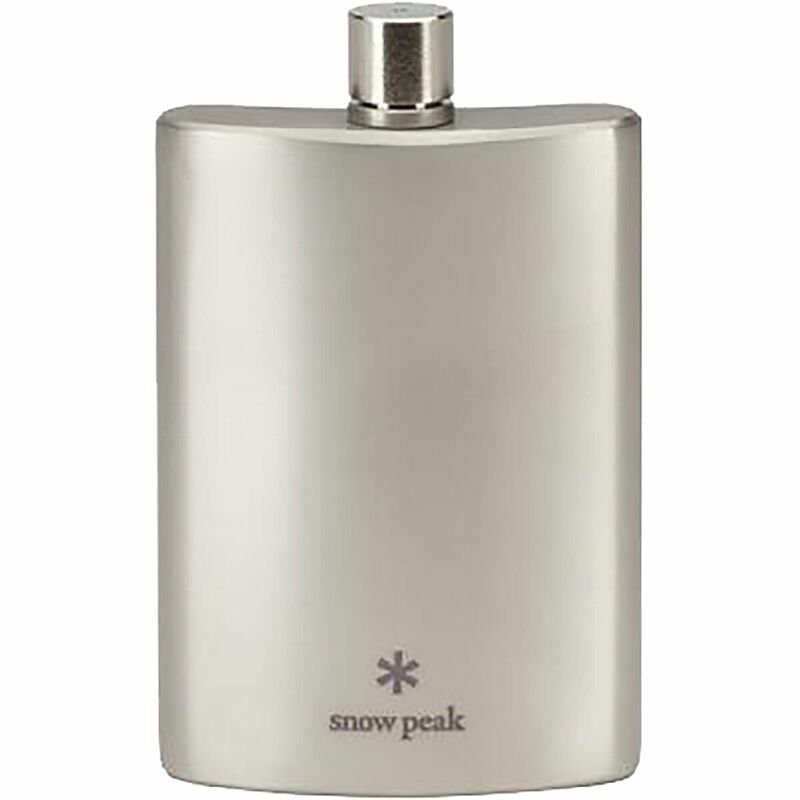 Pouring expensive whiskey in a flask can be a waste of good whiskey, which is why Snow Peak crafted its Medium Flask from titanium. Titanium is lighter, stronger, and more inert than steel. More importantly, though, it doesn't taint your favorite beverage with that unpleasant metallic tinge. The best way to make a fresh cup of coffee is with the Snow Peak Titanium Cafe Press. 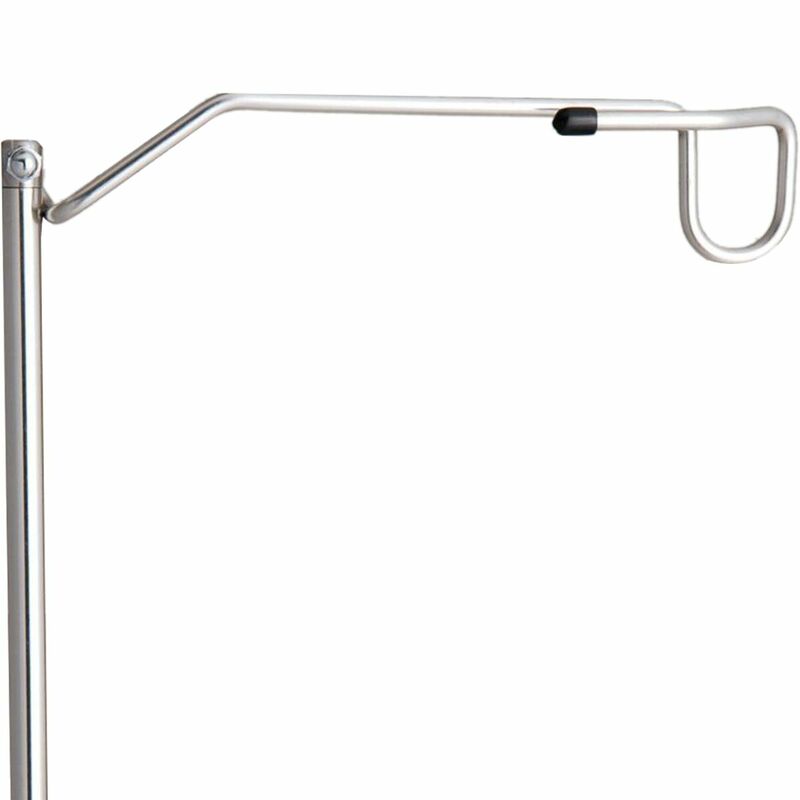 This lightweight titanium press preserves the bean's flavor and oils for an authentic coffee taste. 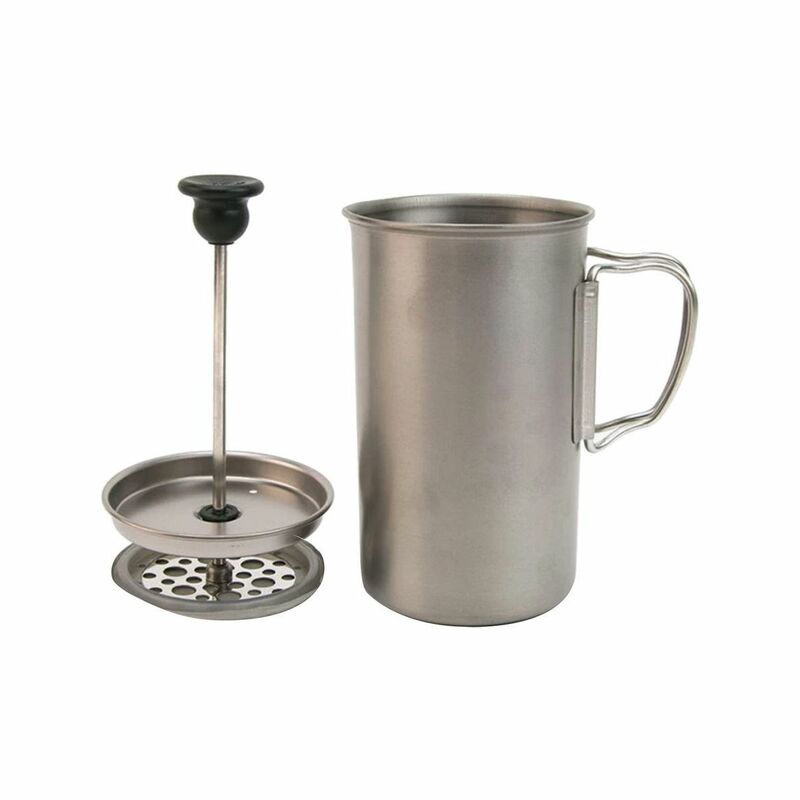 Since all you have to do is boil water, add coffee, and press, this portable press allows you can enjoy great-tasting coffee on the trail, around the campfire, or inside your tent. 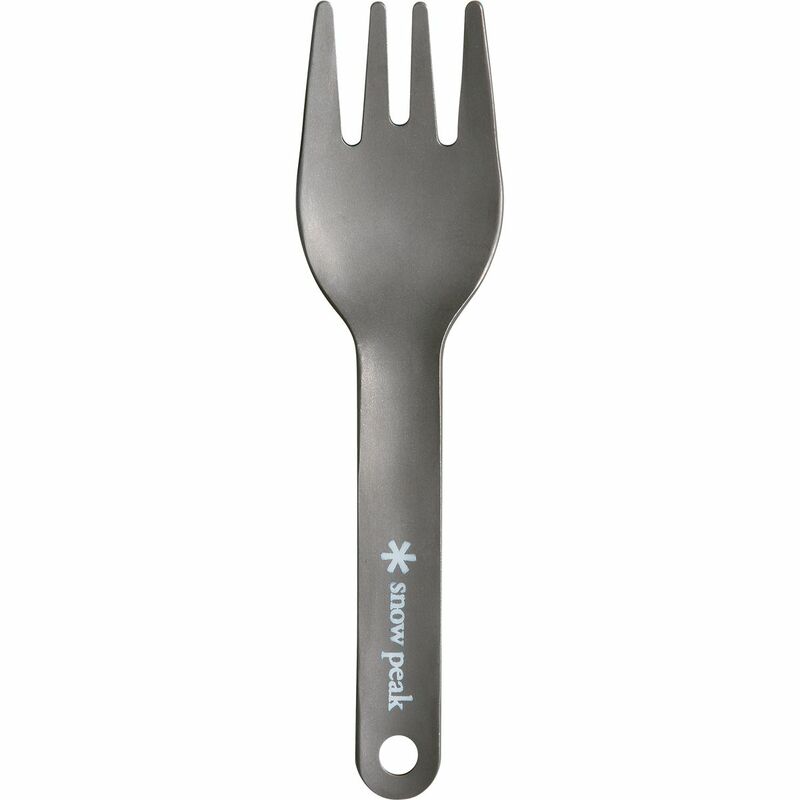 Streamline your backpacking set-up with the Snow Peak Titanium Mini Fork. 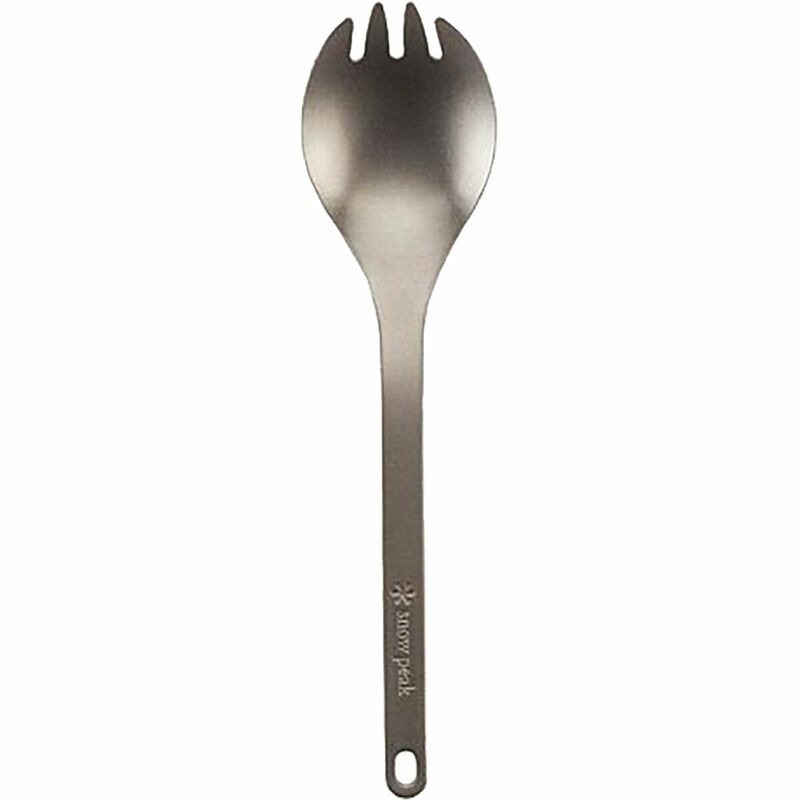 Weighing less than a half ounce, this mini fork won't add excess bulk to your minimalist pack when saving every ounce is absolutely crucial. Titanium maintains high levels of strength and is easy to clean after chowing down in the backcountry. Pretending to be civilized by eating out of something other than a dried gourd when you're backpacking for two weeks in the Sierras isn't difficult when you're carrying a Snow Peak Trek Titanium Bowl. It doesn't cost that much extra weight, either. 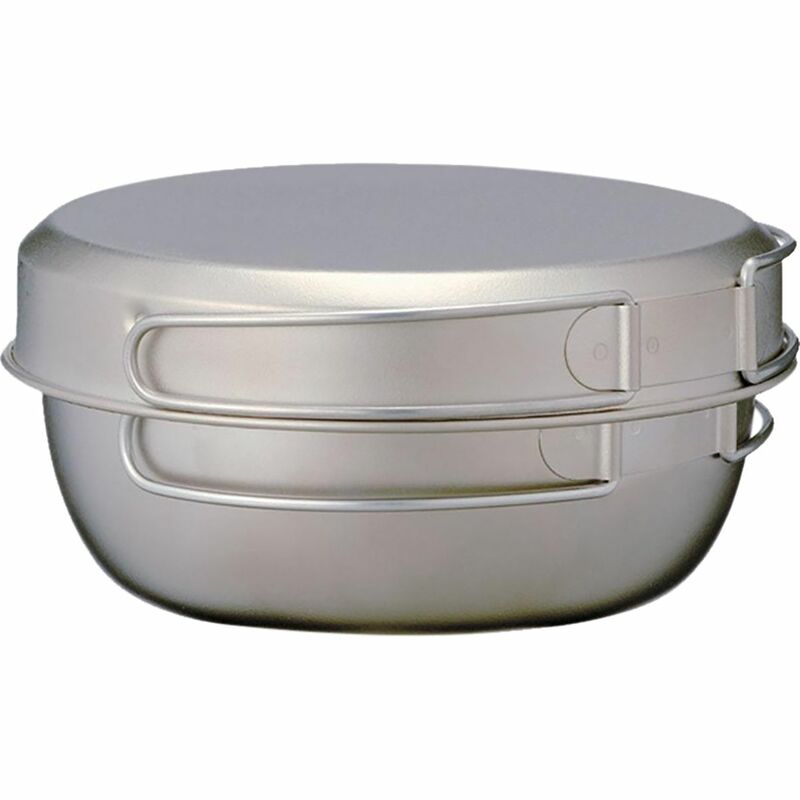 This uber-sturdy bowl keeps your pack light and gives you both cooking and eating options. 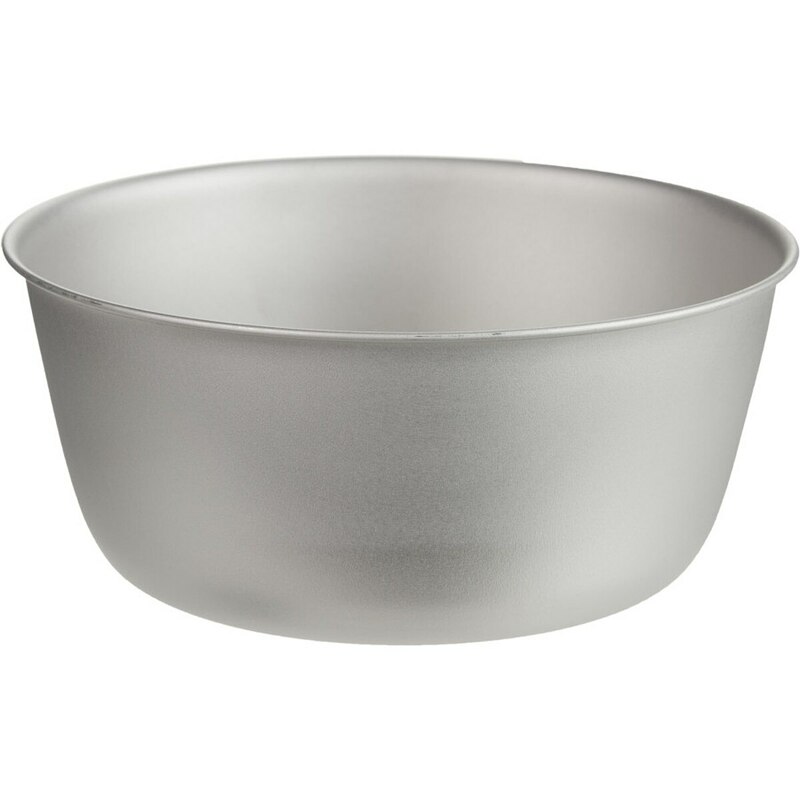 It's crazy but true: you can boil water in this bowl and eat out of it. 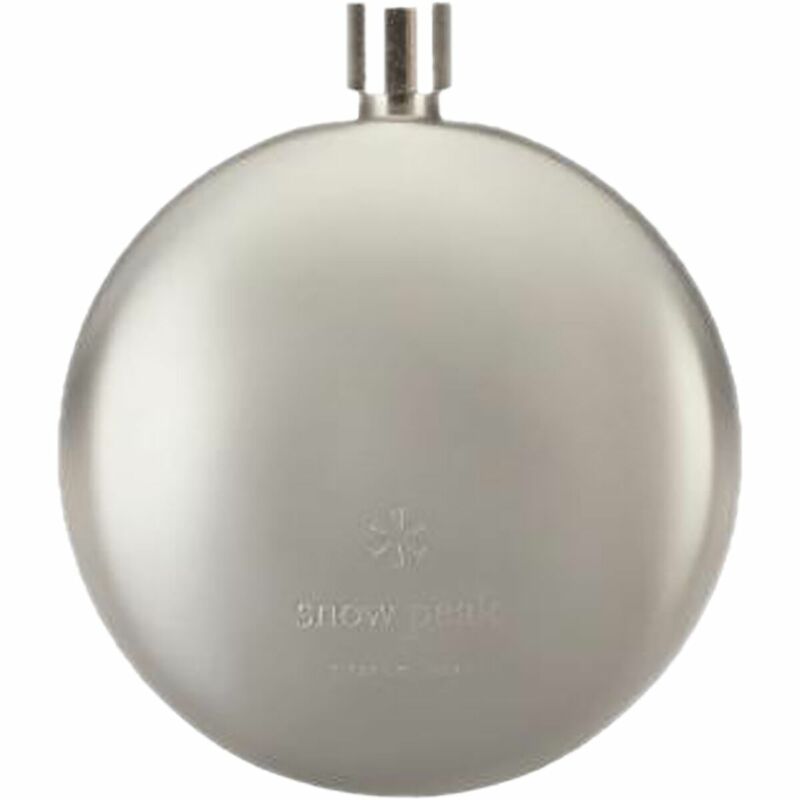 Pack your favorite bev in the light, strong Snow Peak Titanium Round Flask, which won't turn your gin or tea to tin. A featherweight two ounces and the capacity for a six-ounce drink provides the ultimate in portability and hip hydration. In typical Snow Peak fashion, the Entry Pack TT brings you a truly unique camping experience through innovative design and modern style, making it the ultimate introduction for family car camping with all the comforts you could think of. More than just a tent, the Entry Pack TT essentially brings your dream campsite to life, with room to sleep, cook, hang, and play games in. 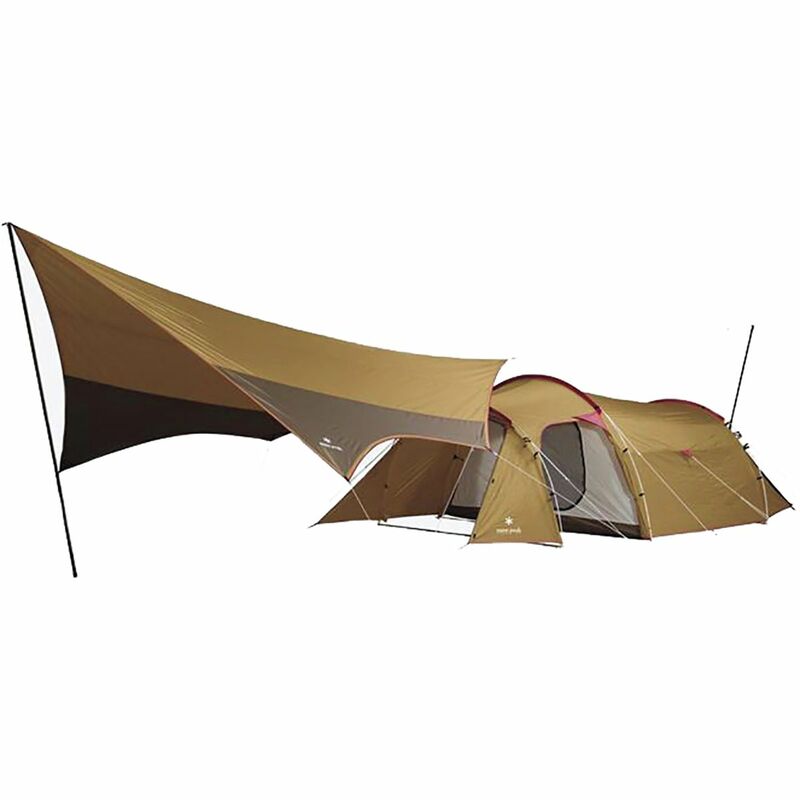 This spacious family tent offers ample room for 4-6 people in the inner tent to fit comfortably, allowing everyone to lounge and sprawl out as much as they want. Then, the inner tent can be removed to transition into a large open area that's still protected from the elements with room for camping chairs and tables to be set up. Snow Peak included a tarp that extends the roof of the tent to create an ideal space for cooking breakfast and making coffee in the morning or just kicking back with a book in shade. 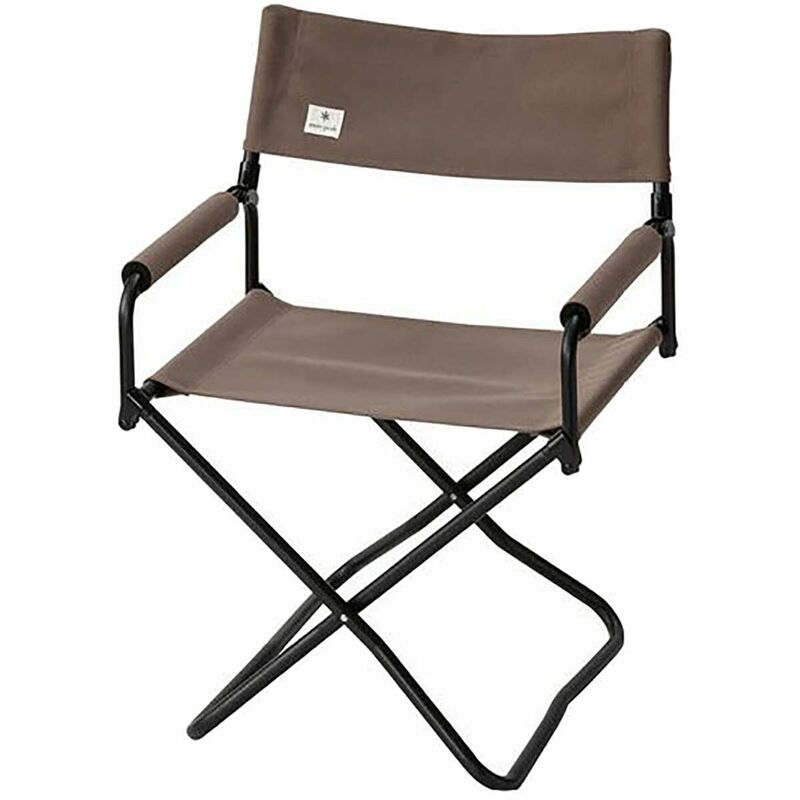 Durable, water-resistant polyester oxford with PU coatings ensures resilience against wear and tear through the elements, while the lightweight yet strong aluminum poles make for a sturdy frame that won't be a pain to haul away when your camping trip is over. Snow Peak's foldable, haulable Take! 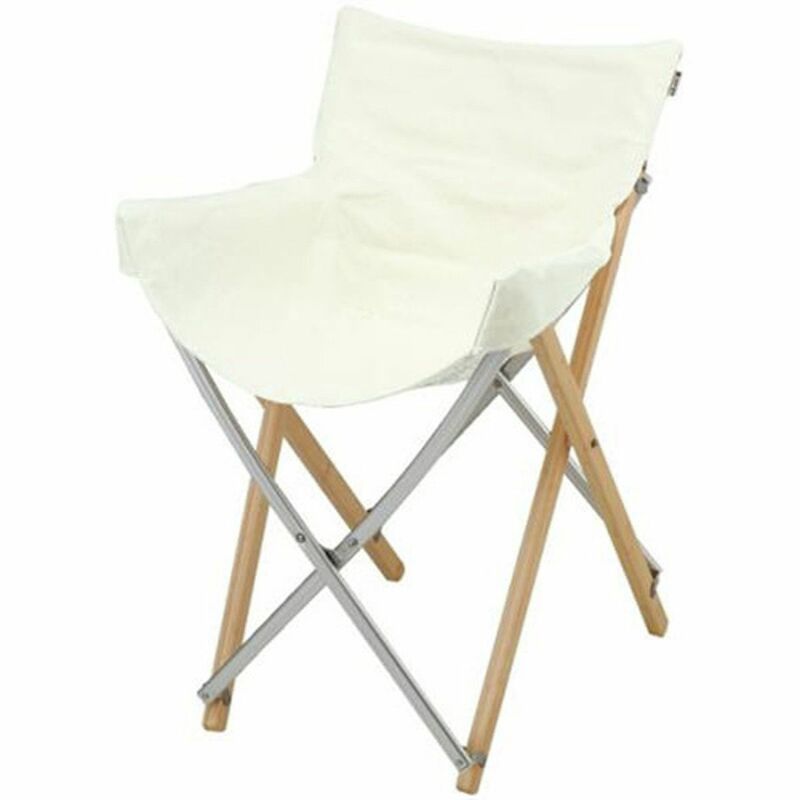 Bamboo Chair features washable, durable canvas fabric for comfortable downtime at family reunions, car-camping trips, or backyard BBQs. After a long day spent hiking, climbing, or surfing it's nice to know that you're not going to have to eat freeze-dried mush out of a bag. The Snow Peak Al Dente Cookset makes cooking gourmet meals at camp that much easier thanks to the two included high-quality stainless steel pots that disperse heat evenly whether you're preparing pasta, steaming vegetables, or bringing your famous lobster bisque to a perfect simmer. Just because you're sleeping in the wilderness doesn't mean you have to suffer through instant coffee in the morning. 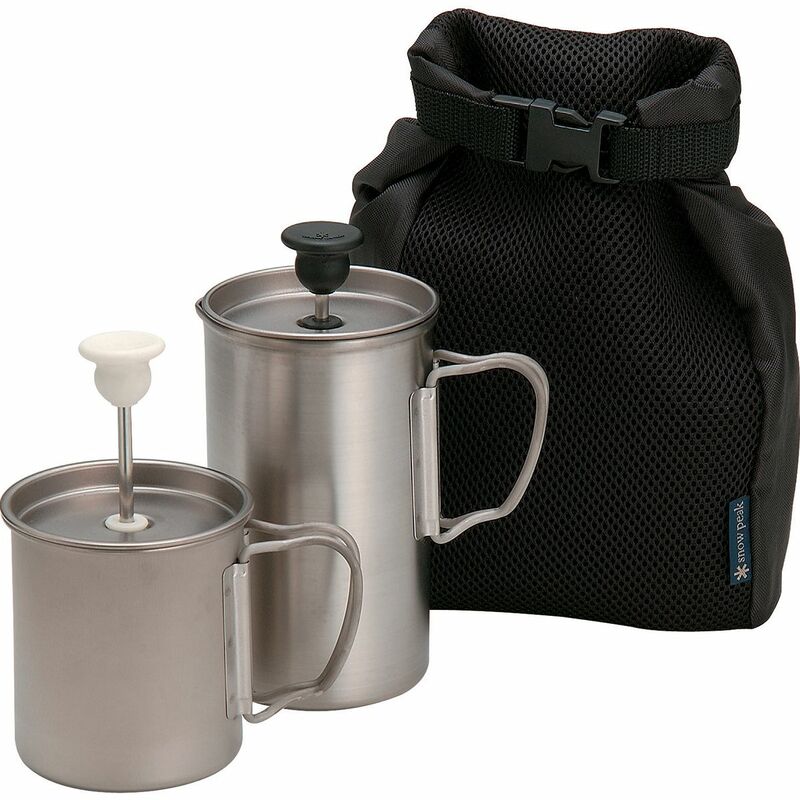 The Snow Peak Cafe Latte Set is an ultralight way to whip up gourmet coffee in the great outdoors. 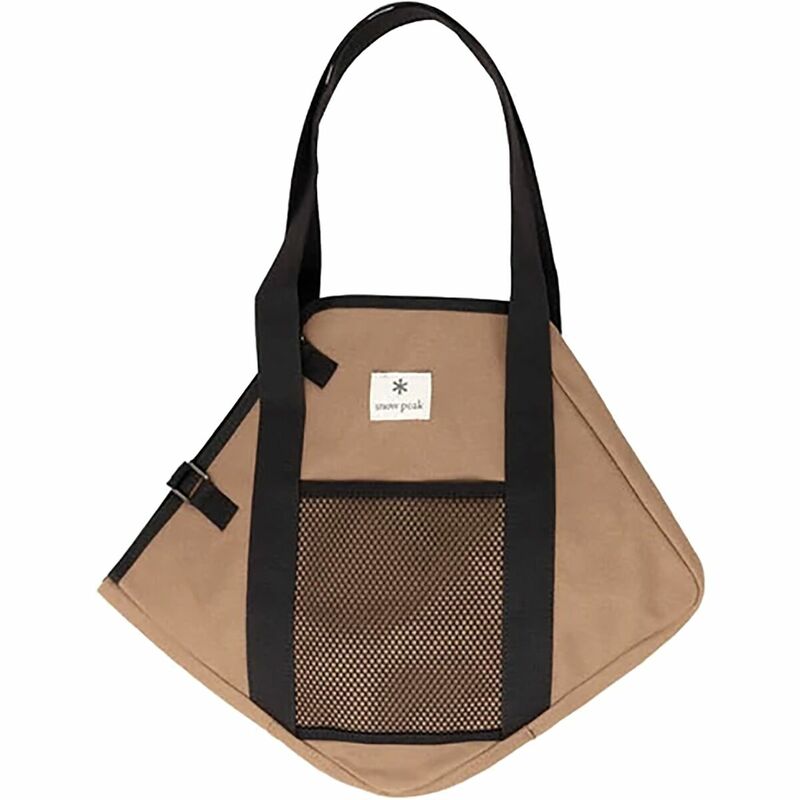 It includes a French press and a milk foamer so you can make tasty lattes to get your day started, and a nylon bag allows for convenient storage. Snow Peak's Charcoal Stand 26 separates your dutch oven from charcoals for a quicker cook time, and a quicker cook time means you get to stuff your face with tasty camp foods sooner. It's a win-win. Look, we would never disparage cast iron cookware--how else are you going to make blueberry cobbler in the backcountry? 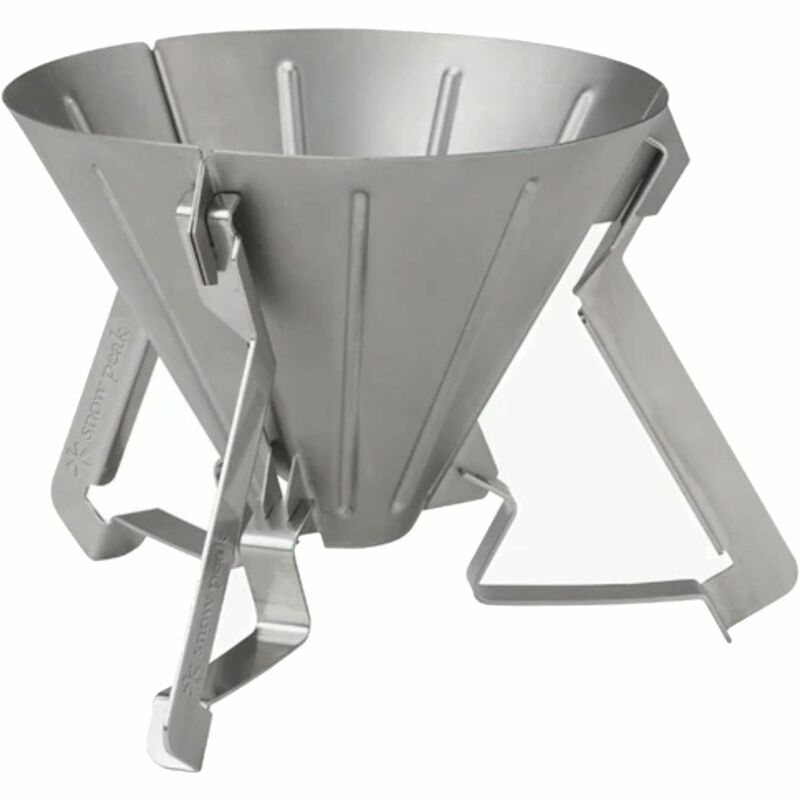 But it does have its drawbacks, and there are times when the Snow Peak Aluminum Small Caldero is the better choice. For one, it's significantly lighter than cast iron without sacrificing much in terms of durability, making it way easier to lug out to distant campsites. 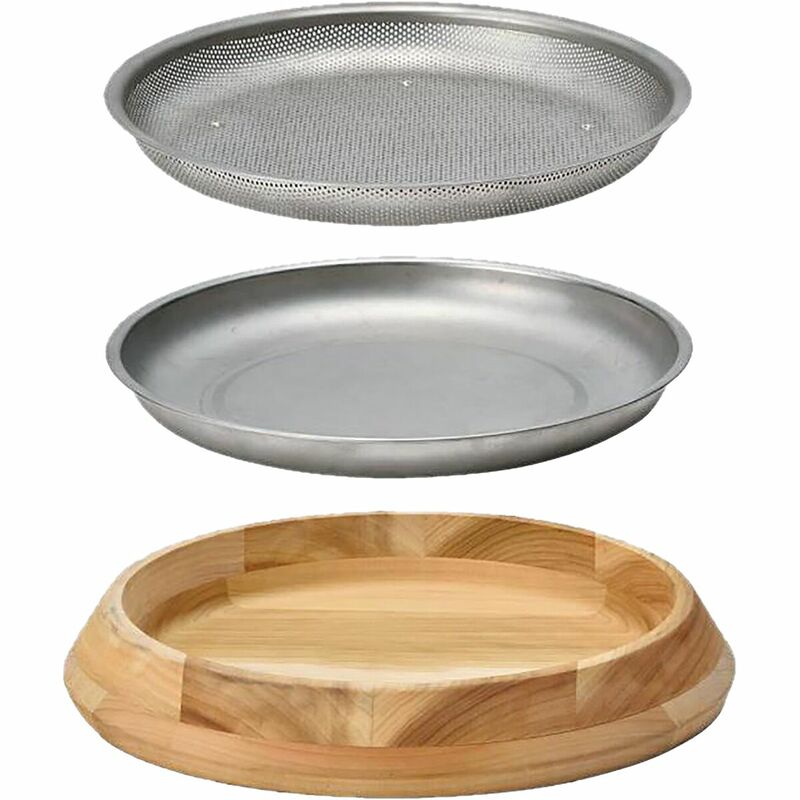 Additionally, it can handle highly acidic foods such as curries and tomato sauces (which can damage your cast iron and make food taste metallic), so you can diversify your camp menu a bit. 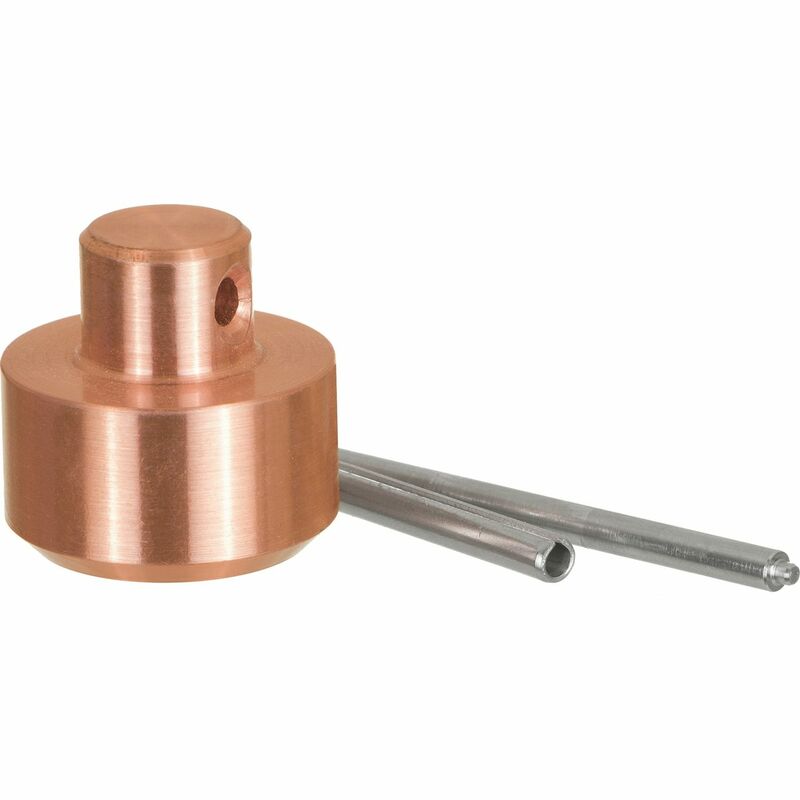 When your frequent camping trips finally get the best of your Snow Peak Copper Head Peg Hammer, simply pick up a Copper Head Replacement and keep it going. Once the party is over and all the guests are gone, it'll be time to take down the lanterns and put away the poles. For safe keeping, use the Snow Peak Pile Driver Case to store your backyard get-together goods. 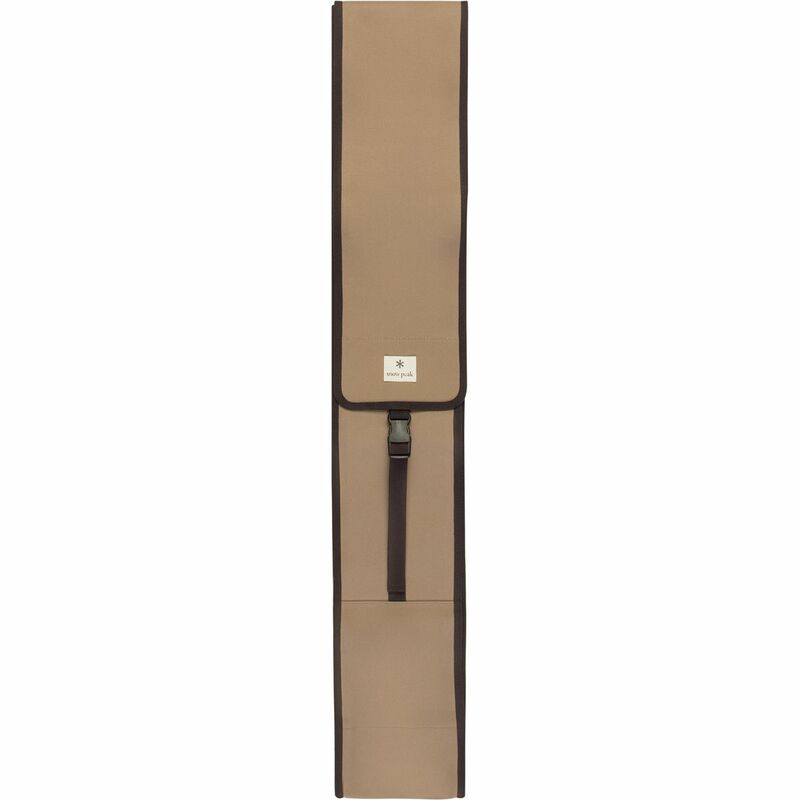 Made of protective leather, poles slide in and out of this case easily so no damage is done in the process. With a secure close, you can be sure that your piles are neatly in place for the next time you need to whip them out to entertain. A good day of camping always starts with the sound of bacon sizzling over a morning fire. 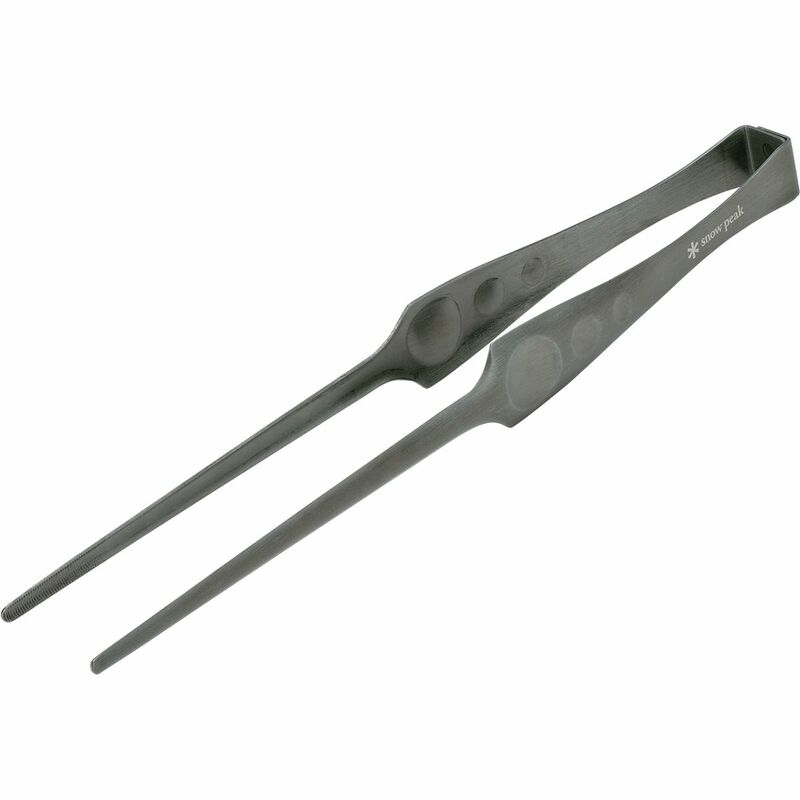 With Snow Peak's Stainless Steel Tongs, you won't worry about melting your utensils because these tongs can handle the heat. 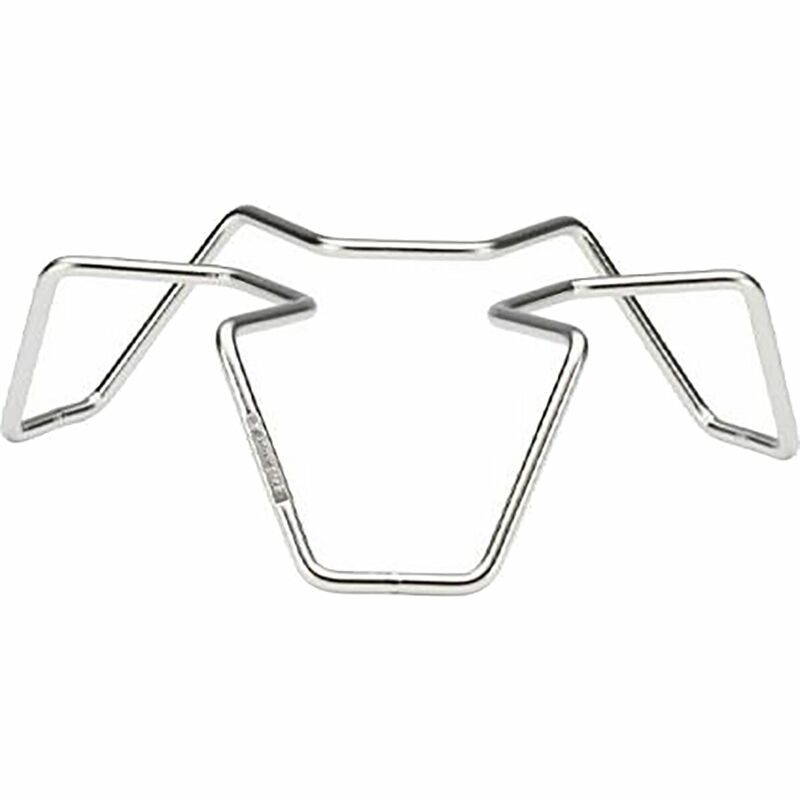 Plus, the steel structure makes them light and hard to break, so you can grill, fry, and boil to your heart's desire. 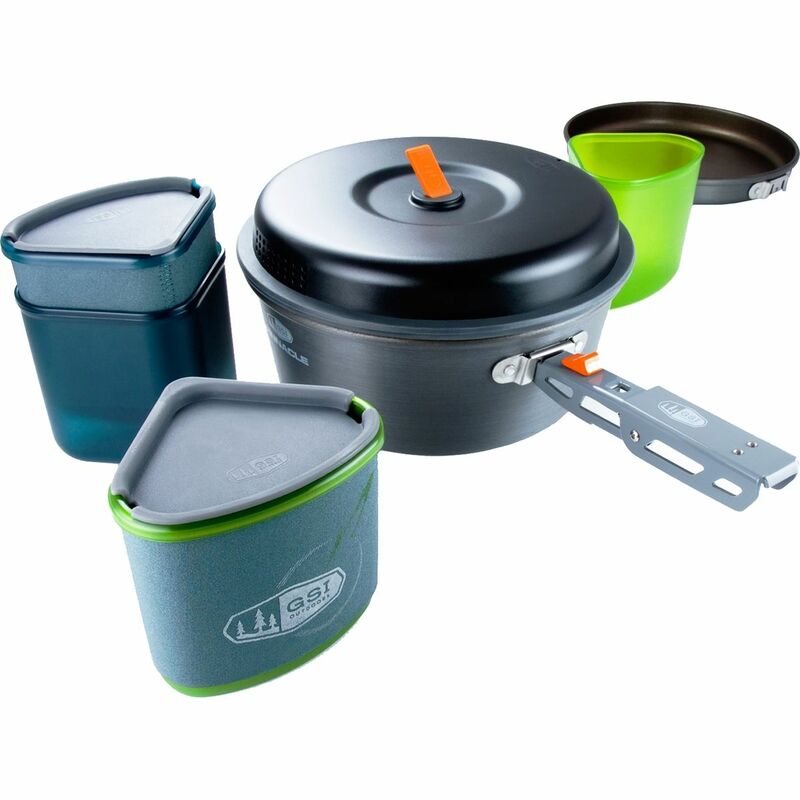 Take the Pinnacle Backpacker Cookware Set on your next backpacking journey and eat like two kings (or a king and a queen ... or two queens) when you're in the woods. A compact nesting system keeps each component tucked inside the next and helps you fight the urge to take everything and the kitchen sink. Everything you need to cook, serve, and clean up is included in this kit; just add a compact stove and some fuel and you're good to go.